Just down the River from where my family lives is the proposed site of the world's largest Pulp Mill. Originally I was reasonably disinterested in this proposed development when it was first mooted in 2003. Then in 2006 the Proponent submitted their Integrated Impact Statement. Normally a developer has to submit an Environmental Impact Statement, but perhaps due its significance this proposal had to evaluate not just its environmental impact but its social and economic impacts as well. When this I.I.S. was submitted to the State Government appointed Assessor, the Resource Planning and Development Commission, significant aspects of its proposal had been changed. This left virtually no time for public submissions to comment on this new proposal since most had assumed that the Proponent was going to formally present its original proposal. Even at this stage I was particularly peturbed though. But then more inconsistencies seemed to emerge that led to me being formally invited to comment on this. I wrote a brief paper on the broad issue of how Christians might respond to environmentalism and in particular: forestry. I then took this Biblical foundation and addressed the ethics and morality of the proposed Gunns Pulp Mill. This went through a fairly rigorous peer review process with several pastors contributing comments and suggestions to its final outcome. It was then distributed to a wider readership of pastors for their comment. Once we collated those comments and polished them into the final draft, approval was given to publish it and distribute it through my email mailing list. Within an hour or so of it being published on the web site (www.findingtruthmatters.org) I was contacted by a State Parliamentarian who requested that it be removed because it was so factually flawed. This then was the beginning of an interesting journey. 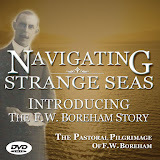 Some have suggested that perhaps it was because our weekly radio program is perhaps the most listened to Tasmanian Christian radio program in Tasmania; or, that our weekly audio podcast is one of the most popular Christian podcasts in Tasmania; or, that our websites have some of the highest traffic in Tasmanian for a Christian web ministry; or, that the Christian community is perhaps the single biggest unorganised voting block in our State- (who knows?) but our concerns were certainly treated very seriously. Within 24 hours of publishing the Paper on the findingtruthmatters.org website I was invited to meet with the Pulp Mill Project General Manager. When Sue Neales found this out she rang for an interview and published this in the Mercury Newspaper. From that story breaking I have been interviewed by several national newspapers and most recently, Four Corners ABC Television who came and filmed our church service and me preaching. Since the Sue Neales article appeared I don't think a day has gone by without someone ringing, writing, emailing, or dropping in to tell me their story regarding this issue. Added to this have been the many Parliamentarians who have contacted me to express their disappointment with me. But to the credit of the Proponent, they have used this as an opportunity for dialogue. I have now met with the management of Gunns three times, the latest meeting being yesterday, where I have continued to raise community concerns with them. The motivation for doing this is both the pursuit of the truth in the public arena, and a deep care for our Valley. It is my prayer that God's will will be done in regard to this Pulp Mill and the truth will come to light. But ultimately my prayer is that this Valley will come to know Jesus Christ as the God who gives us the earth for our benefit and what we do with it is for His glory. I love tennis. I love playing it. I love watching it. When I grew up nearly everyone I knew played tennis. A trip down to the local Corio tennis club meant that you would have to take your turn on the benches for one of the six courts to become free. During this time it was easy to tell when Wimbledon was being played because people would trot off to work and school bleary-eyed from having stayed up all night to watch it on TV. It was the twilight of Australia's dominance as a tennis nation. Players like Newcombe, Roach, Dent, Alexander were hero worshiped. This meant that young Aussie kids wanted to become like these heroes and it very common for professional tennis coaching to be offered through Government Schools (like the one I went to) to help make this a reality. I started being coached from the age of 11 and playing in junior tournaments shortly after. I was committed to being a professional tennis player as I grew up. During my early teenage years I travelled Victoria playing most of the major junior tournaments. When I was 16 I bought my first racquet stringing machine to try and alleviate the spiralling costs of restrings. This is a craft I have maintained over the past 27 years and am still a member of the professional racquet stringers association (USRSA). But I also began to learn that my destiny lay not in playing tennis professionally, but in what I am now doing today. When I arrived in Tasmania in 1995 to take over the pastorate of a small semi-rural church I was reluctant to get involved in tennis here because I wanted to focus on the church without divided loyalties. But as I settled into the pastorate I found that tennis became a healthy distraction. 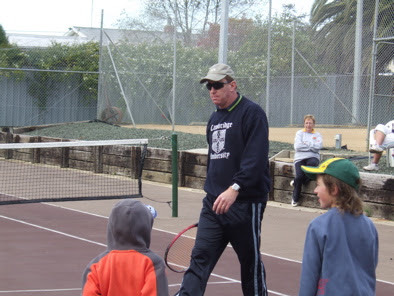 I offered my coaching services in a voluntary capacity to the local club which was soon received with much appreciation and over the years I have coached dozens and dozens of children in the basics of how to play tennis. Most recently I was received by the governing body of tennis in Australia (Tennis Australia) as a registered "Hotshots" coach and made a member of their coaching fraternity. I am now working at recruiting young people to the game of tennis. Last weekend I was interviewed by two newspaper journalists. In recent weeks I had been doing media interviews about my comments regarding the proposed Gunns Pulp Mill at Longreach (just 20 kilometres or so from where I live). But these most recent interviews were about tennis. I was asked by both journalists why I thought it was important for children to play tennis. I answered that tennis is not only about fun and exercise which counters our growing obesity rates, and it was not only a game that could be played at any age (unlike most contact sports), it was also a game of rules which highlighted that even in the midst of tense of competition we have to keep within certain boundaries- which is a great way to view life. Playing tennis is a great life-skills teacher. So I was thrilled when I read F.W. Boreham make similar comments about his love for cricket. He loved watching cricket. Whenever the cricket was on at the MCG he would work his pastoral duties in the morning and then take the afternoon off to go and watch the cricket. Boreham admits to being a poor cricket player but a great cricket lover. It seems that sport and spirituality have a lot in common. The apostle Paul uses certain athletic metaphors to encourage the Corinthian believers in their walk with Christ. For most Australians sport is more important than religion. But I wonder how many Australians realise how many of the principles involved in sport are also the essence of what the Christian life is all about? In cricket there is a bowler trying to get you out much like the enemy of our souls is constantly trying to do. As long as the three stumps stand in unbroken union behind everything the batter does he is safe in much the same way that the Christian is undergirded by the Father, Son and Holy Spirit. In cricket some balls just have to be left alone and allowed to pass through to the Keeper in much the same way that not every attack of the Enemy is worthy of our response. The game of cricket is played over two innings in much the same way that Christian's life is marked by two innings- before Christ and after- and the Word that guides him is marked also by two divisions- Old and New Testaments. The two teams are comprised of twelve players each, similar to the governments of the Old Testament where twelve patriarchs ruled and the New Testament where twelve apostles ruled. In cricket it is often the case that the fastest balls bowled are the easiest to hit for a six just as life's toughest struggles are often the most maturing. Each game of cricket is overseen by an umpire just as life is also overseen by the Umpire. Perhaps a similar process could be undertaken for just about any sport. Rules, an umpire, boundaries, struggle, a goal and cooperation with team members are all essential ingredients to successful living, especially successful Christian living. The next time you play tennis (or any other sport) you are not just exercising your body and mind, you are honing your life skills to be able to live more fully for God.